Gently crush the rosemary leaves with your hand, and add them to a small bowl with the olive oil. Let rest for about an hour, then strain the oil and reserve the rosemary. In a medium bowl, combine the flour, semolina flour, yeast, salt, chopped fennel seed, 13 g (1 T.) of the sugar, 28 g (2 T.) of the infused oil (reserving the rest), and most of the water. Mix with your hands in the bowl until roughly combined. Turn the dough out onto an unfloured counter and continue to mix (knead) with your hands for about 5 minutes, until the dough reaches a medium level of gluten development. Early during this time, adjust the water to achieve a medium-soft dough consistency. Flatten the dough into a disk, spread about 300 g of the grapes onto the dough, and fold the dough repeatedly until the grapes are evenly distributed throughout. Do this gently to keep grape-crushing to a minimum. Transfer the dough to a lightly oiled container. Cover and ferment for one hour at room temperature. 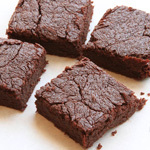 On a parchment-lined baking sheet, press and pat the dough into a rough rectangle, about 12 by 15 inches. Proof, covered, for about 35 minutes at room temperature. Press the remaining 100 g of grapes into the surface of the dough. Brush generously with some of the remaining infused oil and sprinkle with the remaining 1 T. sugar, a few whole fennel seeds, and a few of the reserved rosemary leaves. Continue to proof, covered, for another 35 minutes. Bake the schiacciata for about 25 minutes, until the crust is golden brown and the grapes are starting to burst and ooze purple juice. Cool on a wire rack, or serve warm. Yum, looking good, made this once when I got a bucket of grapes from the neighbor.. recipe said to deseed. I didn’t. Oh and accidentally using star anise instead of anise seed wasn’t such a lucky move either. Eating was quite the experience. Oh, this looks fabulous! I made a version of this bread last fall with concord grapes – the recipe I used said to use seeded grapes. It was delicious, and I’d do it again in a hearbeat – with seedless grapes, though! I’ll bet this would be wonderful using the tart cherries that are just starting to come into season here. Hmmm. . . . This always sounded strange to me … until I tried it and I’ve been a believer since! This looks just heavenly, Susan! This looks really good…tempted to try it out. 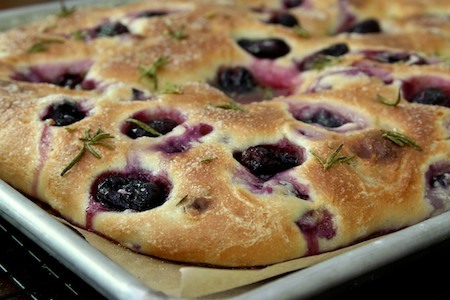 I always thought grapes in bread sounded strange and unappealing… UNTIL I made a focaccia with grapes for a dinner party. What a hit it was! Looks beautiful Susan. I’ve made this several times and it is really delicious, but it never looks as good as yours does. This looks fantastic. The browned top, the juices from the grapes, and the rosemary are making me hungry! I’ve never done fresh grapes in bread before, but I’m now compelled to try! I’m betting that great color contrast foreshadows a sweet and savory contrast as well. Gorgeous! What a dreamy loaf of bread! Bookmarking! The schiacciata looks absolutely delicious. I think blueberry filling would be my pick. I think I know what I’m doing this weekend. My only tweak will be a light sprinkling of Maldon to finish. What a lovely bread! I’ve never made schiacciata before, or foccacia for that matter, but this grape and fennel bread sounds like a very interesting combination. Do you eat it with something, or on it’s own? 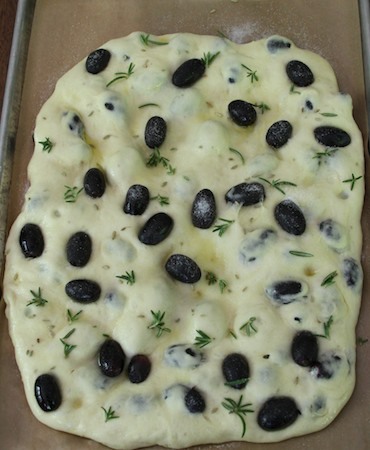 We tend to eat foccacia with olive oil and balsamic vinegar, or to start a meal. I imagine the fennel and grape would make it a little harder to pair things with. You just reminded me how wonderful the blue cheese, grape and rosemary foccacia I made awhile back was, but… this looks so much better. I love how you pressed some of the grapes into the bread. It looks stunningly beautiful!! 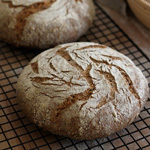 I make a variety of this bread and it is always a hit. My recipe is very simple and does not include herbs, just seedless black grapes, little sugar, almonds and olive oil. Last summer when I made it, I had some extra dough and extra grapes, so I just wrapped a piece of dough around a grape and baked about 20 of them in a separate pan. Grape bread finger food! I was one of your students at SFBI baguette course last December. It was the best course and my bread baking has improved along with my self-confidence in my techniques. Since that course, I use a scale to weigh the ingredients, a thermometer to check the temp of the dough and final product and am getting good at shaping. Thanks for this website and for all of your inspiration. Fennel seeds and grapes together! And rosemary too. Cool. I must admit I’d never have thought of that combination – but why not? So often we exclaim over getting hints of licorice and/or herbs in the wine we taste. @Mimi: blue cheese, rosemary and grapes, that sounds really good too! Wow! Susan, this is the most gorgeous schiacciata I have ever seen! But coming from Ms. Wild Yeast I am not surprised. I have wanted to make one for so long and now I know where I’ll be turning to for the recipe. Perfect and mouthwatering! I grew up in Middletown, Connecticut, a town with a large Sicilian population. A few pizza joints always had scacciata – which seem like a simpler version of your schiacciata. They are like large slightly more bready calzones, stuffed with broccoli and sausage, potato and onion, sausage and peppers. I haven’t seen anything quite like it before. Just thought the bread historian in you might be interested. BTW, your recipe looks fanatastic! Ciao Susan Your schiacciata (the name tuscan people use in general for bakeries pizza) looks really wonderful ! In the original recipe there is no hard wheat because that is traditional of the southern breads but I’m sure it did no harm ! 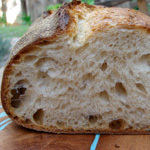 Hi Susan, Just saw your post (rather a bit after the fact), and the schiacciata looks lovely. I live in Florence, and schiacciata con l’uva is all over the place right now (being grape harvest season), so I thought I would chime in with some info. First, schiacciata and foccaccia are one in the same. What name you use depends on where you are–schiacciata is the Tuscan version. Schiacciata con l’uva is typically looks pretty close to what you’ve made, but often involves a whole ton more grapes (they tend to be piled on/pushed in quite thickly–tasty, but does ultimately effect the texture and integrity of the dough itself). Also, schiacciata is generally not filled with things, rather tomatoes, prosciutto, cheese, olives etc are placed on top (like the grapes). In this form, it is quite similar to pizza in concept. The main difference seems to be mostly that Italian pizza has very thin crust, where as foccaccia is always relatively bready (so foccaccia with topping might end up being rather like some American thicker-crust pizzas). 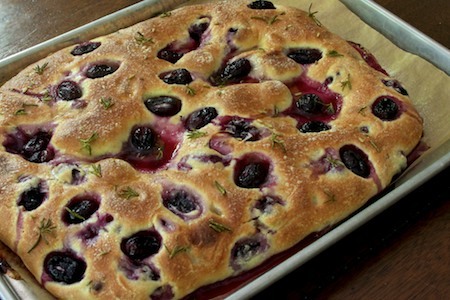 I’ve been thinking for several weeks that I really ought to try making some schiacciata con l’uva, and after seeing your post I’m all the more inspired. Perhaps I’ll have to pick up some wine grapes the next time I’m at the market! This was one of the favorites of at the FCI’s bread program; whenever we had a ‘free’ recipe slot open and the materials at hand, this ended up in the oven. It makes amazing ricotta or fresh mozzarella and prosciutto sandwiches, and as a previous poster mentioned, is always welcome at parties. So many surprised faces when they get that rich olive-y, jammy, herbal mouthful. And it’s so easy to make, you almost feel guilty about it. One of my later summer favorites subs blueberries and thyme with just a pinch (seriously — no spoons, just a pinch) of cinnamon and nutmeg to really bring together the sweet and the herbal. And now I’m glad that I’ve got the correct name! 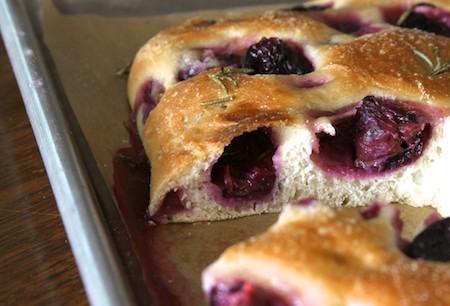 I’ve just been calling it rosemary-grape focaccia for ages. This looks adorable! I would never think of using grapes in a bread recipe. Thanks for the idea!